England coach Andy Robinson insisted the 47-13 victory over Wales was a sign that his side were growing into a formidable team. "The autumn (Test matches) set a benchmark for our performances and that was a level up," said Robinson. "We tried to get an attacking rhythm and it was good to see interchange between forwards and backs. "This is about growing a team. We have very solid foundations and you are seeing the start of it." 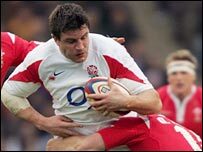 England ran six tries past the Grand Slam champions - from Mark Cueto, Lewis Moody, Mike Tindall Lawrence Dallaglio, Matt Dawson and Tom Voyce - as Robinson's side looked to play a more expansive game. "It was a great try from Mark Cueto and then a completely different try when Lewis Moody was driven over," said Robinson. "We have great leadership. Martin Corry led the team tremendously well, Charlie Hodgson leading the attack and Lewis Moody leading the defence have been superb. This is a whole team effort. "Wales asked a lot of questions of us. Dwayne Peel was given one gap and took it and they scored a very, very good try. They didn't make many errors. "There were two sides out there who wanted to go and attack each other." Robinson is so close to getting it right - will he now take the next step? The coach was keen to stress that nothing should be read into the late substitution of Corry by former skipper Dallaglio, returning after 17 months of self-imposed exile. "What pleased me was, not just Lawrence, but the way the whole bench made an impact. I took Martin Corry off because I thought the game was won," said Robinson. "He has had a rib injury and and I thought it was the right thing to do to give him that time off because we are playing Italy next weekend. "I did the same with Charlie Hodgson - we have a good bench and one of the things we looked at was our ability to use it." Corry was keen that England build on the momentum they have generated following victory over Australia and an improved performance against New Zealand in the autumn. "We started well and it was a very disciplined peformance. It's nice to use that as a springboard," said Corry. "We're not saying we're the finished article but it's a step up from the autumn internationals." Corry was full of praise for prop Matt Stevens, who was named man of the match. "He set the tone for the way we wanted to play the game," said Corry. "He was excellent in the loose."